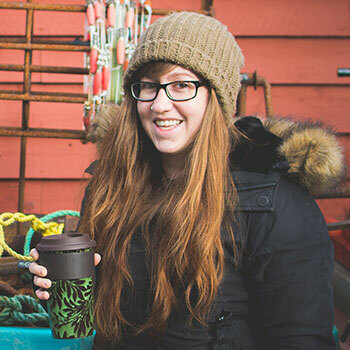 Crystal Braye is a folklorist with the Wooden Boat Museum of Newfoundland and Labrador. Her work involves documenting cultural heritage and curating museum exhibits for a variety of publics. Laurier’s Anthropology program was instrumental in helping me find my career in the field of cultural heritage, and providing me with a strong academic foundation that I continue to draw on every day. In my third year, I enrolled in AN334: Folklore, Myth and Oral Narrative and discovered an academic field that explores stories, beliefs, customs and oral traditions in their cultural contexts. From jokes and riddles told by the San people in Botswana, to grotesque urban legends about KFC, these shared cultural exchanges inform how we understand ourselves, interact with each other, and shape our sense of place. After graduating from Laurier, I decided to deepen my knowledge in this field by completing a Master of Arts (MA) in Public Folklore at Memorial University of Newfoundland and Labrador (MUN). There I pursued my interest in concepts of authenticity, identity construction, performance, and cultural expression through the study of the ways in which heritage, traditions, and cultural practices build communities, shape people’s perceptions of themselves, and connect them to one another. The training I received in theory, research ethics and concepts such as cultural relativism in Laurier’s Anthropology program helped me succeed in my MA program. As part of the Public Folklore program, I completed two internships. During my first internship with the Heritage Foundation of Newfoundland and Labrador I conducted research on root cellars which involved mapping, architectural surveys, and conducting oral interviews focused on the intangible aspects of built heritage. My second internship was with the Wooden Boat Museum of Newfoundland and Labrador (WBMNL) where I conducted oral history interviews with boat builders and fishermen in order to explore how wooden boats were designed, constructed, and used. I also assisted with documenting wooden boats through a process that enabled us to capture the shape of the boat in a way that allows others to replicate the design. After completing the internship, I was hired full-time to lead the WBMNL Documentation Program and have continued this work throughout the province. In addition to documentation research, I am now also responsible for all forms of museum interpretation including exhibits, online content, and printed publications. Laurier’s Anthropology program made me aware of the responsibilities that accompany the presentation of cultural heritage to emic and etic audiences. What I learned about authority, voice, language, interpersonal relationships, and representations challenges me every day to be critical and conscientious in my work.